The Principles for Election Management, Monitoring and Observation in the SADC Region (PEMMO) was launched in three SADC countries holding elections in 2006,Zambia, the DRC and Madagascar. By the end of 2006 PEMMO was firmly established as the authoritative set of principles in the SADC; EMBs, political parties and CSOs across the region have used,cited and refered to PEMO. Some began to incorporate them into training materials, assessment tools and handbooks and electoral reform processes were increasingly informed by it. In December the three year PEMMO promotion programme came to an end and EPP adopted a four year follow up programme "Enhancing the Capacity of Election Practitioners". PEMMO was further popularised throughout the SADC region in 2005. The popularisation took the form of distributing the document to a variety of election stakeholders with a focus on countries holding elections in 2005. An effort was also deliberately made to distribute in Zambia, the Democratic Republic of Congo (DRC) and Angola in anticipation of their respective elections in 2006. Moreover, citizen observers were trained in the use of PEMMO as an instrument for election assessment. Training for citizen observers was conducted in the DRC, Angola, Zambia and Zanzibar. Formal PEMMO launches were held in all countries holding elections. It is worth mentioning that in Zanzibar PEMMO was launched in Swahili for the first time. These activities allowed civil society organisations and political parties to use the principles in assessing electoral processes in the region. EPP conducted a PEMMO dissemination drive primarily in those countries holding elections in 2004. A campaign of launching the document in those countries was successfully carried out. Training was conducted for domestic observer groups in the same countries on the use of PEMMO. The principles were also translated into election observation data collection forms, which became the main tools of EISA observer missions in South Africa, Malawi, Botswana, Namibia and Mozambique. It was, therefore, possible, not only to disseminate PEMMO as a set of ideal benchmarks, but also to put the benchmarks to practical use in assessing the five elections that took place in the SADC region in 2004. A significant highlight for EPP was an SADC regional conference on 5-6 November in Johannesburg at which the PEMMO)was adopted. This was the culmination of three years of consultation and drafting work by a task team elected at a regional conference in Namibia in June 1999. Members of the Electoral Support Network were instrumental in the consultation process and the final adoption of the PEMMO. In partnership with the Electoral Commissions Forum of SADC Countries workshops were convened aimed at electoral stakeholders in each of the SADC countries to work towards consensus on electoral norms and standards. These workshops with political parties and civil society bodies worked at the formulation of a common understanding of electoral processes, appreciation of the conditions that electoral management bodies must operate in and on assistance in problem solving during the electoral cycle. In 2001 EISA's then Information and Research Unit completed a good deal of its BADC funded project on "Building Consensus on Electoral Principles and Guidelines". The overall objective of the project was to enhance the democratisation process in SADC countries by building consensus on these amongst key stakeholders such as electoral commissions, political parties and civil society organisations. The project sought to provide a forum to in each country to meet, discuss, develop and agree on the principles and guidelines. In 2000 the Consensus Building Project, funded by DANIDA and managed by EISA's Democracy Development Services in conjunction with the ECF, completed survey profiles for most countries through the use of external researchers in each country and these were distributed amongst the political parties represented in the various SADC countries' legislatures. The goal here was to generate discussions, build consensus and develop principles and guidelines for effective regional electoral practices on national and regional levels. A conference was convened in Namibia in June 2000, by EISA together with the University of Namibia and the ECF, to establish motivation for the generation of Norms and Standards for best electoral practice in Southern Africa. 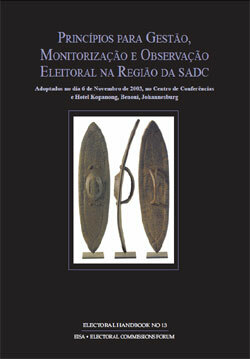 There a Task Team was established in 2000 comprised of researchers, academics, electoral authorities and various important interest groups in the SADC region to assess current practice in the region and internationally on aspects such as constitutional and legal framework, the role of electoral authorities and their independence, etc, in preparation for the development of regional Norms and Standards for best electoral practice. Three EISA members, two researcher and its Executive Director formed part of the Task Team. In conjunction with the ECF, Regional researchers were employed to investigated the conduct of the most recent elections in each country and reported their findings to the relevant electoral management body so that once this consultation was completed political parties could be solicited for their input into the development of electoral principles. 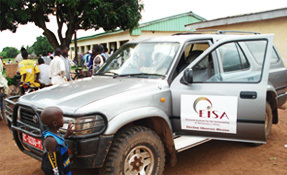 In 1998 EISA, the ECF and NGONESSA (the fore runner of the Electoral Support Network) continued to work together towards the formulation and promotion of electoral best practices. In July 1997 EISA facilitated a roundtable of electoral commissions in the SADC region at which the ECF was initiated and the ECF and EISA began work on the development of a set of principles for electoral practice in SADC countries.